Skoda are getting closer than ever to having their first electric car ready for production. Intensive real world testing on their Skoda Octavia Green E Line started recently. Ten of the Skoda’s are being driven in the Czech Republic, including one at the busy Prague airport. This initial test run is a vital part in the development of the Skoda Green E Line, as the real world data collected will allow Skoda engineers to further refine the cars’ specifications. It interconnects with the comprehensive internal testing currently going on at Skoda Auto, before the final trial phase in late March this year. At that stage, Skoda will make a selection of their new Octavia Green E Line cars available to selected partners, such as government organisations and utilities. But before then, Skoda needs to know that the Octavia Green E Line will stand up to the demands of everyday life. Skoda say that in this initial real world test, they aren’t treating the prototypes any differently than they would a production model. They want to make sure that the Octavia Green E Line is simple and easy to operate, and stands up to both the daily commute and one-off journeys. 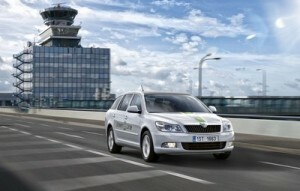 The results will enable Skoda to make vital adjustments to the way their electric powertrain works. They are all set to make any ease-of-use changes to the car that the tests show is needed. Skoda is anticipating that some areas for improvement might include the positioning of the charging socket, or how to make the almost-silent electric car audible to pedestrians, cyclists and other road users. The Skoda Green E Line is the newest addition to the hugely popular Octavia range, and is based on the Skoda Octavia Combi. Thanks to its modular design, the Octavia Combi is an ideal car to adapt for electric power. And as you would expect from Skoda, the Octavia Green E Line is designed to be ultra-practical for everyday life. It accelerates from 0 to 100kph in 12 seconds, and reaches a top speed of 135kph. With a range of up to 150 km, the greenest Skoda is set to effortlessly meet the requirements of most commuters.